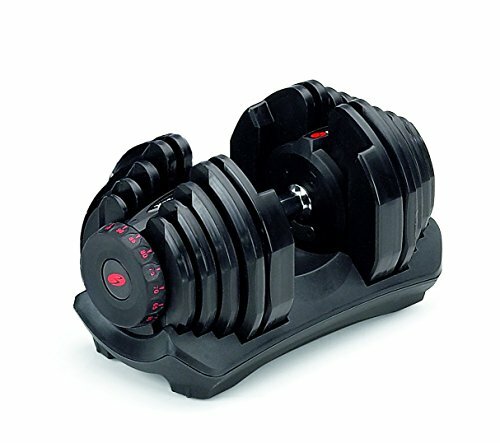 The Bowflex SelectTech 1090 is an adjustable dumbbell that easily replaces the users need for multiple dumbbell sets. By being able to increase and decrease your weights by small increments, the user has the advantage of being able to suit their workouts to their personal needs, whether it be a lighter workout or a more intense workout with heavier weights simply by twisting the dial. The kit also includes a DVD that demonstrates over 30 exercises that the user can do with the Bowflex SelectTech 1090 called “Secrets of the 4-Step Rep”. Users can adjust the weights from 10 pounds to 90 pounds, which makes this system friendly for both beginners and workout enthusiasts alike. The general idea is to be to easily increase the weight as your overall strength increases. It may be helpful to keep workout charts to track your performance. The weight increments are broken down by 5 pounds, meaning the user can very gradually increase the weight as they go without having to purchase separate weight plates or additional dumbbells of specific plates. The plates themselves have a molding on them that allows the user to workout quietly, and a generous three year warranty is a definite plus. However, it is important to mention that only one dumbbell comes with each order.